"Tis a very pretty place ... I think there is nothing to be done but to send an immediate note to Mr Harrison to let him know I will be at Middlethorpe with my family Tuesday next." Constructed in 1699, this property is today a four star hotel offering a total of 29 rooms and suites split between the main property and the adjacent 18th century courtyard. It boasts a swimming pool & spa, a traditional panelled dining room, and plenty of antique furnishings. 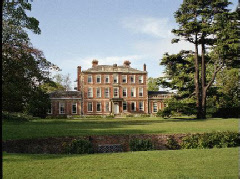 The hotel is part of the National Trust, with profits being donated to the charity.